It is hard to argue the every ecommerce business requires constant analysis. Otherwise, there is a risk to lose everything or at least run an online enterprise with the least possible effectiveness. Unfortunately, the default Magento platform (we are talking about its both versions) does not offer a robust analytics and reporting system, but you can always rely on third-party solutions, such as Mirasvit Advanced Reports. The tool lets you get the profound insight into the performance of your Magento website, and below we will introduce you to all nuances of the Advanced Reports extension. Mirasvit’s module is available for both Magento 2 and Magento 1, so it doesn’t matter what version of the ecommerce platform you use. 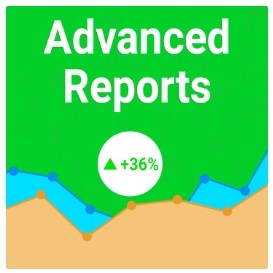 The closest competitor of this tool is AheadWorks Advanced Reports. 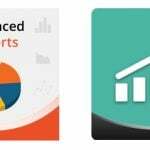 The best Magento 1 extensions related to this niche are gathered here: Extended Analytics and Reporting Solutions for Magento. Also, if you are looking for appropriate Magento 2 modules, we are going to collect all of them here: Extended Analytics and Reporting Solutions for Magento 2. As for sales, you can get a full overview report as well as data gathered by hour of day, day of week, coupon code, cart price rule, customer group, payment type, tax rates, category, geo-data, customers, attributes, and attribute set. When it comes to customers, the Mirasvit Advanced Reports extension enables you to compare new and returning buyers. If you are wondering which reports are related to products, the module offers data on product performance, showing bestsellers. It is also necessary to mention that you can easily export any report data in the format of CSV or XML files, sending it to other specialists for further analysis. As a result, you get a perfect opportunity to find and leverage the most precise performance indicators. Let’s see how Mirasvit Advanced Reports for Magento 2 and 1 looks from inside. We will describe how Mirasvit Advanced Reports for Magento 2 and 1 works on the example of the Sales Overview report. Mirasvit Advanced Reports for Magento 2 and 1 lets you choose different periods: Day, Week, Month, Quarter, or Year. 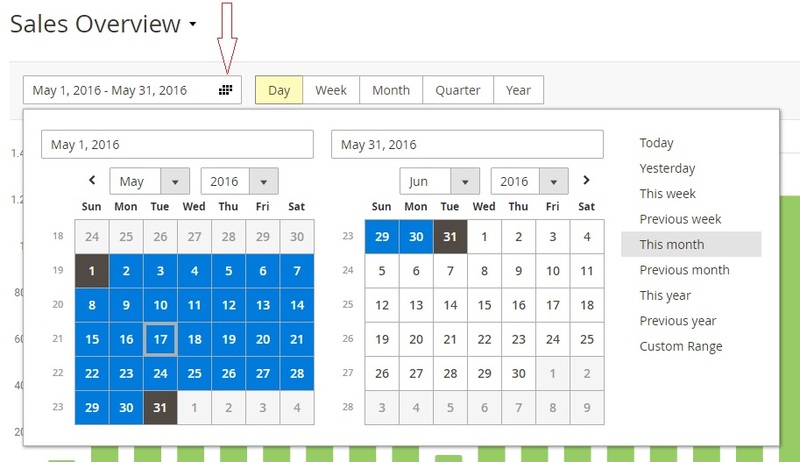 At the same time, you can set more precise parameters with the help of calendar option. You can set a period manually, or choose among the predefined ones: Today, Yesterday, This week, Previous week, This month, Previous month, This year, or Previous year. There are also two buttons on the right that switch the diagram views between column and line charts. 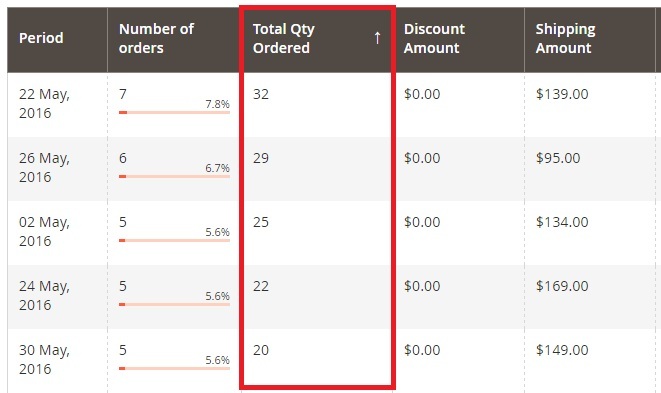 Below, you see some parameters that can be added to the diagram: Number of orders, Total Qty Ordered, Discount Amount, Shipping Amount, Tax Amount, Total Refunded, Subtotal, and Grand Total. Creating a diagram based on any number of them is possible. Below the diagram, you can see various settings that control the table with sales overview data. You can apply different filters, set the number of columns (there are 29 columns available), export CSV and XML files, and choose the number of lines per page. Tap on a column header to arrange lines in ascending/descending order. Other reports are based on the same principles, but some parameters may vary. As you can see, Mirasvit Advanced Reports for Magento 2 and 1 enables you to catch the in-depth analytics insight rapidly. You no longer have to deal with complex reports and data that only specialists can understand. 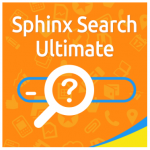 The extension provides the ability to eliminate third-party specialists from ecommerce analysis saving your time and money. Moreover, due to high customizability, you can get the most precise level of detail. Now, analyzing your Magento store performance indicators is just a matter of seconds. Besides, you can customize everything on-the-go, adjusting such parameters as time range (do everything manually or apply ready-to-use presets), column order and quantity, types and details of charts, and more. To make the interface of Advanced Reports even more friendly, Mirasvit provides the ability to utilize drag & drop functionality for customizing your report grid, as well as apply various filters so that you can get your precise data most comfortably. As for powerful filters and sorting options, they enable you to operate all reports data without any headaches. The extension supports filtering by any field: you only have to enter the desired data range. Thus, you can save much time applying filtering and sorting. All these features help you seamlessly find out the most precise performance indicators of your Magento storefront. You can even find out the number of orders and totals of an item of a particular color since there is the Sales by Attribute report available with Mirasvit Advanced Reports for Magento 2 and 1. Furthermore, you can get all detailed geographical data sorted by country, state, city, or postcode! As a result, the extension provides the ability to gain a better understanding of your target audience, improving the overall ecommerce performance. Boost your performance (with advanced analytics and reporting system, you will quickly enter the next ecommerce level).